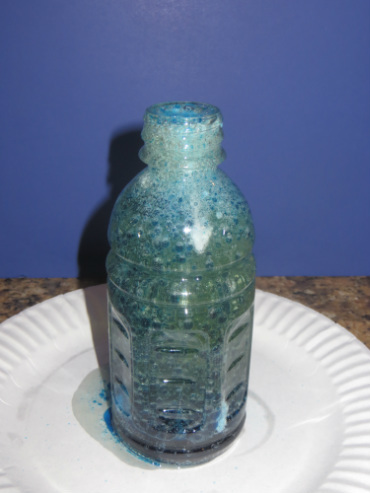 What happens when vegetable oil, water, food coloring, and Alka Seltzer are mixed together? Material 1: Place a small plate on the table under the bottle to protect the table from spills. 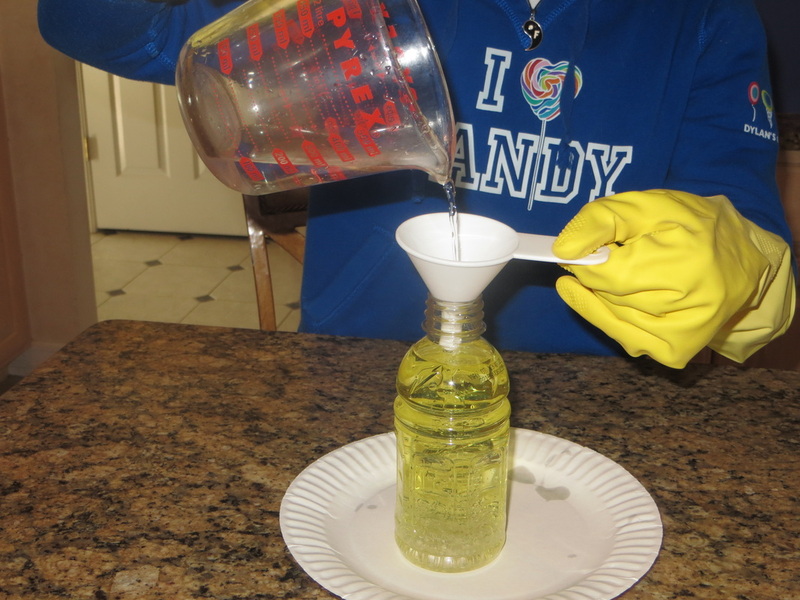 Material 2: Use a funnel to pour the vegetable oil and water into the bottle to avoid any spills. Material 3: Wear gloves to protect your hands from oil and food coloring. Material 4: Make sure you have a cloth or paper towel nearby. Material 5: Put a tablecloth on the table to protect it from vegetable oil. 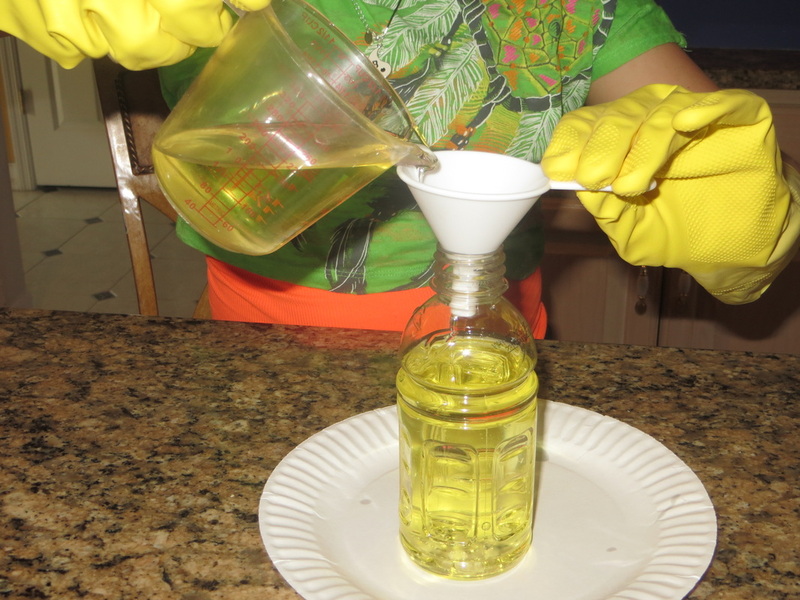 Pour vegetable oil into the bottle until it is about 3/4 full. Add about 1/4 water to the rest of the bottle. 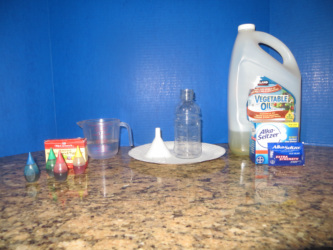 Put about 10-12 drops of your favorite food coloring into the bottle. (Wait until the water at the bottom of the bottle turns dark). Break 2 Alka Seltzer tablets into chunks. Start dropping the Alka Seltzer chunks into the bottle. Sit back and watch the color explosion! It looks like a lava lamp! Once the liquid settles, you can add more chunks of Alka Seltzer tablets. After the liquid settles again, fill the bottle to the rim with the vegetable oil and screw on the cap. 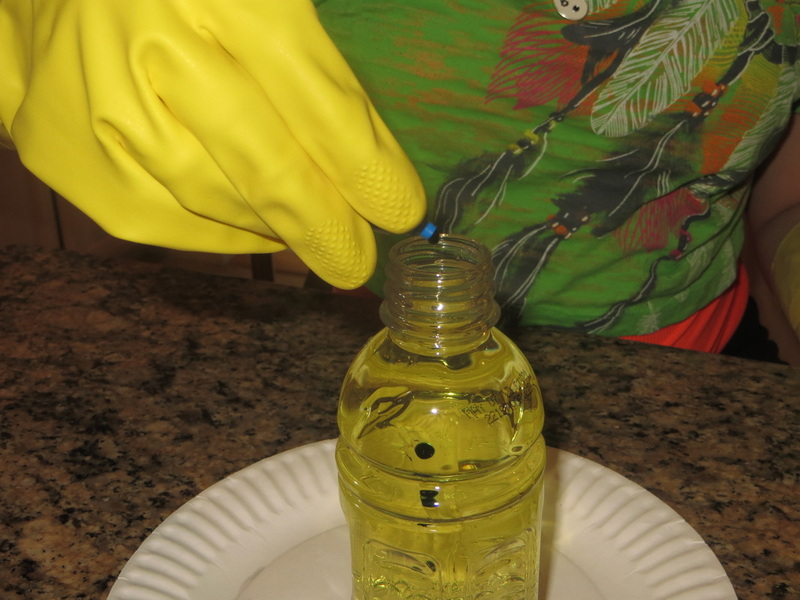 Tip the bottle back and forth to see the waves that are created when oil and water refuse to mix. Water and oil do not mix when you put them together in a bottle. Since water has a greater density, the water goes to the bottom of the bottle and the oil, which has a lower density, will float on top. When you add the Alka Seltzer, it releases bubbles of carbon dioxide gas that rise up to the top and carry colored water. The gas reaches the top and escapes from the bottle while the colored water falls back down. The Alka Seltzer causes this reaction because it contains citric acid and baking soda which react with water to form sodium citrate and carbon dioxide gas. Jennifer is in Mrs. Carvo's class in 5th grade. She is 10 years old. 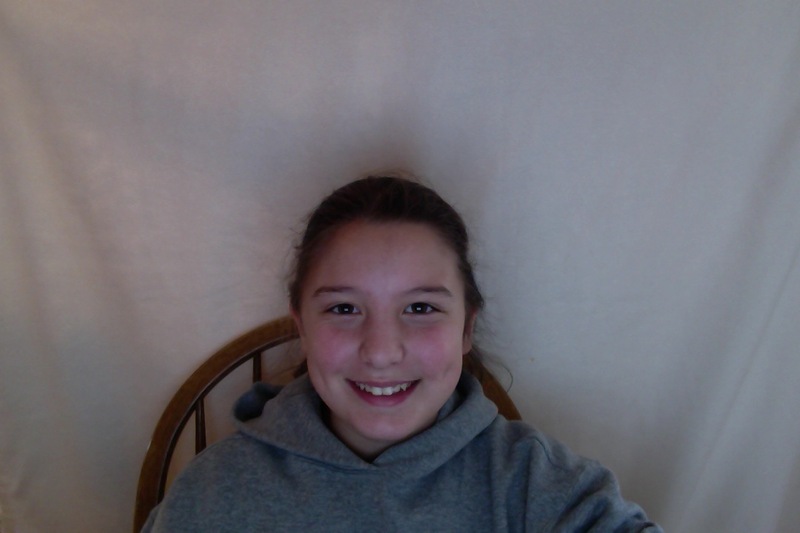 Jennifer enjoys cheerleading, dance, swim, ice skating, and soccer. Katie is in Mrs. Gronert's class in 5th grade. 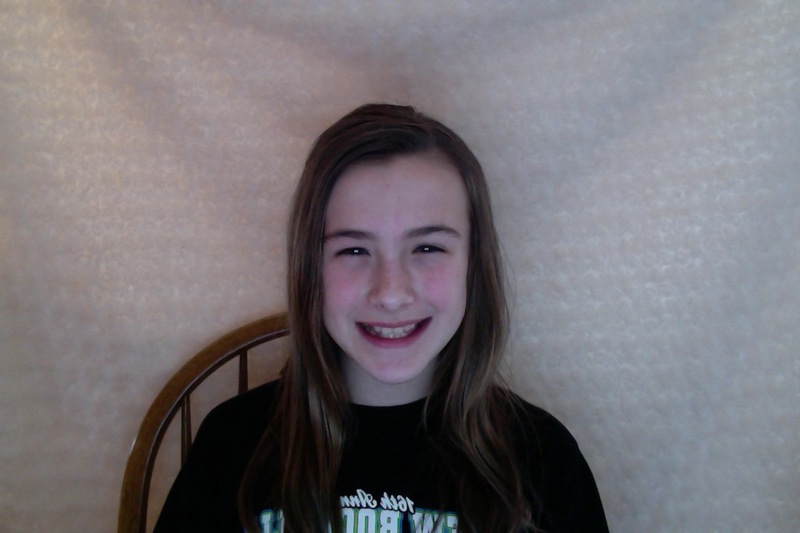 she is 10 years old.Katie enjoys cheerleading, swimming, dancing, and doing the cup song.